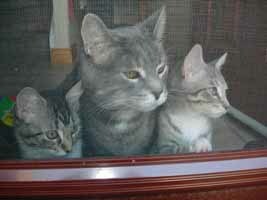 We adopted Chloe and Andy (formerly known as Carolyn and Geoff) on June 19, 2008. Since that day, they have become a huge part of our family and brought us so much happiness and laughter! Our older cat, Jimmy, has become attached to these little guys ... unfortunately, the toilet paper roll has never been the same! lol! Last year, Jimmy lost his life-long buddy named Jessie. Chloe and Andy have brought him back to his old self. In the picture, you can see just how well they are getting along! We would like to thank the Animal Welfare Association of Hamilton for making our family just a bit bigger and Jimmy a lot happier!